QuickXis an innovative decentralized platform that is intended to provide effective solutions to some of the critical problems with blockchain technology such as time, cost, scalability and cross transfer of blockchain assets while making cryptocurrencies suitable for mass adoption in day-to-day transactions and provide solutions to enterprises. QuickX provides transfer of different cryptocurrencies between two parties instantly just like any other traditional electronic transfer mechanism. Thus allowing transactions to happen seamlessly and instantly without user having to pay a high network fees as it is taken care by the pooling facilitators in the network who facilitate the cross-chain transactions to take place instantly! QuickX features a multicurrency wallet, a multicurrency debit card, a cryptocurrency swap option, and a payment gateway using Quickx Protocol, which make cryptocurrencies suitable for the masses for non-virtual world transactions. Although it is unlikely, that blockchain ecosystems will replace traditional banking system altogether in the near future, they represent a significant threat to the traditional banking system. Cross Blockchain Transactions requires solid blockchain team which is clearly not the case with the team. ..so basically they are creating a Centralised Bridge between Alice and Bob to speedup the transaction without needing mining and that too cross blockchains! Really? How come without confirmation you can commit the transaction? Is platform going to take a risk of volatility? Do team has enough money in bank to leverage Investors or platform users lost? Even they reach hardcap 30k ETHs - this will be difficult to fill the RISK associated with this solution. MVP seems backend hacked solution and artificial reviews on the App on Google! Red flag to me!! Will update ratings after hear back from the team. Thank you for your feedback. It's the duty of every expert to do the thorough research before giving a rating. The parent company of a QuickX Protocol is around a decade old and is currently the country's one of the fastest technology growing companies ( Covered by Inside success Magazine ) Also, our team got awarded by Vice-president ( India ) for innovation. Our developers are the contributor in Cosmos & Lightning network. Running a business for around a decade we have a very well built Reputation, team, and experience. All these information are available on a website. P.S. - There are many Industry leaders who have already joined QuickX Protocol advisory like Former EU Commissioner and Finance Minister of Malta, CEO of Coinomi wallet, CTO of Huawei Technologies, EX CMO of NEWSBTC, President of Gigamedia (listed in NASDAQ), CEO Smart Chain technology etc. All the Advisors are not for window dressing, they are actively participating to make it a success. I have been following their development since many months. Its impressive to see their growth happening along. They have got a good team of advisors as well as industrial partnerships. Their product is a dire need of the market and I am happy to see that they are coming up with this solution and founders coming from Indian background make India proud. The team is heavily experienced in the field and they are developing this project since a while. The vision to bring blockchain in an off-chain way for non-expert internet user is really nice. Product still gets a 4 because the idea is not totally disruptive, but still a great project to be carried on! Quickx has a great team,with a proven trackrecord. They have a great team of advisors that can contribute greatly. The company behind the platform has great clients, proving that they are also succesful and can reeach their goals. The protocol has a great vision and product that can help the crypto-industry. 50 % of tokens sold is a good percentage for industry standars. Awesome project! 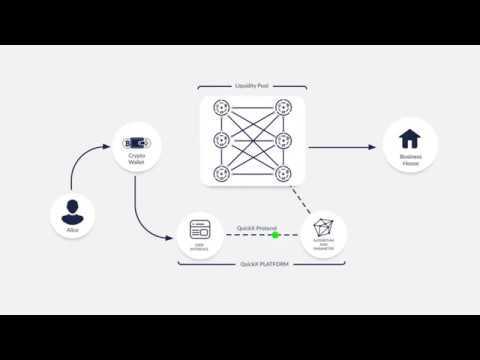 Solving interoperability with smart protocols and PFs. This protocol will be scalable once the network velocity of pegged cryptocurrencies increases. The protocol will perform off-the-chain transactions for the same blockchain assets while using on pooling facilitators supplying liquidity for cross-chain crypto asset transfers. Space has something of Kyber and Ox protocol but this project makes cross chain transfers easy. The projects has good team and and a very interesting idea, however execution of these ideas can prove to be challenging. An MVPis not yet there, should arrive soon. All in all, a decent project. Best of luck! Thank you for your valuable feedback. We launched our MVP last month. It's available on Play store. P.S. - Updated version of MVP will be launched this week. Also, it has got over 1000 downloads. Experienced team with solution to a real problem. Great vision. Such a project is needed in the current market. Really excited to see how the project goes. They have a good team and track record in technical development. They have done good partnerships with well known people in Blockchain industry and have partnerships with central governments of some countries. Their MVP is going to be launched, that is awesome. Other competitors are in the market and they need to focus more on after launch service, marketing and partnerships. Launched beta version of multicurrency wallet- Android app. Raised $1.2 Million from an angel group. Crypto debit card supporting multiple currencies.